Welcome to Yann's home page. Room 1220, 715 Broadway, New York, NY 10003, USA. Note: the best way to reach me is by email or through Hong (I don't check my voicemail very often). My main research interests are Machine Learning, Computer Vision, Mobile Robotics, and Computational Neuroscience. I am also interested in Data Compression, Digital Libraries, the Physics of Computation, and all the applications of machine learning (Vision, Speech, Language, Document understanding, Data Mining, Bioinformatics). Blog posts, news and updates on Google+. 2013-10-16: announcing the 2014 International Conference on Learning Representations: a conference about deep learning, feature learning, compositional hierarhcical models, etc. It uses an open reviewing process similar to what I advocate in this pamphlet. Center for Data Science, and the NYU Data Science Portal. Short bio: if you want to know more about me. Computational and Biological Learning Lab, my research group at the Courant Institute, NYU. CILVR Lab: Computational Intelligence, Vision Robotics Lab: a 20-person lab consisting of my colleagues Rob Fergus, Savid Sontag and me, together with our students and postdocs. VLG: The Vision-Learning-Graphics Group consisting of the CILVR Lab, plus our colleagues in computer graphics, movement analysis, and human-computer interfaces. Research: descriptions of my projects and contributions, past and present. Publications: (almost) all of my publications, available in PDF and DjVu formats. Google Scholar Profile: all my publications with number of citations, harvested by Google. Preprints on ArXiv.org: where you will find our latest results, before they may receive a stamp of approval. My lab at the Courant Institute of New york University is called the Computational and Biological Learning Lab. It is part of VLG: the Vision-Learning-Graphics Group, an informal group of researcher interested in pixels (in analyzing them or in producing them). We are working on a class of learning systems called Energy-Based Models, and Deep Belief Networks. We are also working on convolutional nets for visual recognition , and a type of graphical models known as factor graphs. See, watch and hear talks and tutorial. Many computer Science researchers are complaining that our emphasis on highly selective conference publications, and our double-blind reviewing system stifles innovation and slow the rate of progress of Science and technology. This pamphlet proposes a new publishing model based on an open repository and open (but anonymous) reviews which creates a "market" between papers and reviewing entities. Animals and humans can learn to see, perceive, act, and communicate with an efficiency that no Machine Learning method can approach. The brains of humans and animals are "deep", in the sense that each action is the result of a long chain of synaptic communications (many layers of processing). We are currently researching efficient learning algorithms for such "deep architectures". We are currently concentrating on unsupervised learning algorithms that can be used to produce deep hierarchies of features for visual recognition. We surmise that understanding deep learning will not only enable us to build more intelligent machines, but will also help us understand human intelligence and the mechanisms of human learning. We are developing a new type of relational graphical models that can be applied to "structured regression problem". A prime example of structured regression problem is the prediction of house prices. The price of a house depends not only on the characteristics of the house, but also of the prices of similar houses in the neighborhood, or perhaps on hidden features of the neighborhood that influence them. Our relational regression model infers a hidden "desirability sruface" from which house prices are predicted. 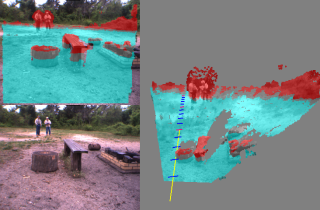 The purpose of the LAGR project, funded by the US government, is to design vision and learning algorithms to allow mobile robots to navigate in complex outdoors environment solely from camera input. My Lab, collaboration with Net-Scale Technologies is one of 8 participants in the program (Applied Perception Inc., Georgia Tech, JPL, NIST, NYU/Net-Scale, SRI, U. Penn, Stanford). Each LAGR team received identical copies of the LAGR robot, built be the CMU/NREC. The government periodically runs competitions between the teams. The software from each team is loaded and run by the goverment team on their robot. The robot is given the GPS coordinates of a goal to which it must drive as fast as possible. The terrain is unknown in advance. The robot is run three times through the test course. The software can use the knowledge acquired during the early runs to improve the performance on the latter runs. CLICK HERE FOR MORE INFORMATION, VIDEOS, PICTURES >>>>>. 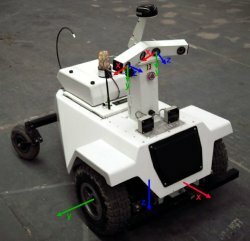 Prior to the LAGR project, we worked on the DAVE project, an attempt to train a small mobile robot to drive autonomously in off-road environments by looking over the shoulder of a human operator. CLICK HERE FOR INFORMATION ON THE DAVE PROJECT >>>>>. CLICK HERE FOR MORE INFORMATION, PICTURES, PAPERS >>>>>. The recognition of generic object categories with invariance to pose, lighting, diverse backgrounds, and the presence of clutter is one of the major challenges of Computer Vision. 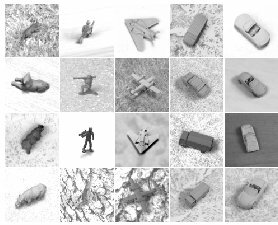 I am developing learning systems that can recognize generic object purely from their shape, independently of pose and lighting. The NORB dataset for generic object recognition is available for download. Tired of Matlab? Lush is an easy-to-learn, open-source object-oriented programming language designed for researchers, experimenters, and engineers working in large-scale numerical and graphic applications. Lush combines three languages in one: a very simple to use, loosely-typed interpreted language, a strongly-typed compiled language with the same syntax, and the C language, which can be freely mixed with the other languages within a single source file, and even within a single function. Lush has a library of over 14,000 functions and classes, some of which are simple interfaces to popular libraries: vector/matrix/tensor algebra, linear algebra (LAPACK, BLAS), numerical function (GSL), 2D and 3D graphics (X, SDL, OpenGL, OpenRM, PostScipt), image processing, computer vision (OpenCV), machine learning (gblearning, Torch), regular expressions, audio processing (ALSA), and video grabbing (Video4linux). If you do research and development in signal processing, image processing, machine learning, computer vision, bio-informatics, data mining, statistics, or artificial intelligence, and feel limited by Matlab and other existing tools, Lush is for you. If you want a simple environment to experiment with graphics, video, and sound, Lush is for you. Lush is Free Software (GPL) and runs under GNU/Linux, Solaris, and Irix. My main research topic until I left AT&T was the DjVu project. DjVu is a document format, a set of compression methods and a software platform for distributing scanned and digitally produced documents on the Web. DjVu image files of scanned documents are typically 3-8 times smaller than PDF or TIFF-groupIV for bitonal and 5-10 times smaller than PDF or JPEG for color (at 300 DPI). DjVu versions of digitally produced documents are more compact and render much faster than the PDF or PostScript versions. Hundreds of websites around the world are using DjVu for Web-based and CDROM-based document repositories and digital libraries. Yann's DjVu page: a description of DjVu, and a set of useful links. DjVuZone.org: samples, demos, technical information, papers, and tutorials on DjVu.... DjVuZone hosts several digital libraries, including NIPS Online. DjVuLibre for Unix: free/open-source browser plug-ins, viewers, utilites, and libraries for Unix. Commercial DjVu Software: free plug-ins for Windows and Mac, free and commercial applications for Windows and some Unix platforms (hosted at LizardTech, the company that distributes and supports DjVu under license from AT&T). Any2DjVu and Bib2Web: Upload your documents and get them converted to DjVu. Bib2Web automates the creation of publication pages for researchers. My main research interest is machine learning, particularly how it applies to perception, and more particularly to visual perception. I am currently working on two architectures for gradient-based perceptual learning: graph transformer networks and convolutional networks. Convolutional Nets are a special kind of neural net architecture designed to recognize images directly from pixel data. 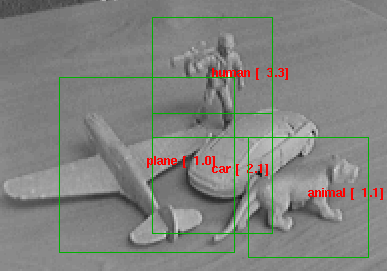 Convolutional Nets can be trained to detect, segment and recognize objects with excellent robustness to noise, and variations of position, scale, angle, and shape. Have a look at the animated demonstrations of LeNet-5, a Convolutional Nets trained to recognize handwritten digit strings. Convolutional nets and graph transformer networks are embedded in several high speed scanners used by banks to read checks. A system I helped develop reads an estimated 10 percent of all the checks written in the US. Check out this page, and/or read this paper to learn more about Convolutional Nets and graph transformer networks. The MNIST database contains 60,000 training samples and 10,000 test samples of size-normalized handwritten digits. This database was derived from the original NIST databases. MNIST is widely used by researchers as a benchmark for testing pattern recognition methods, and by students for class projects in pattern recognition, machine learning, and statistics. Playing Music: particularly Jazz, Renaissance and Baroque music. A few MP3 and MIDI files of Renaissance music are available here. Building and flying miniature flying contraptions: preferably battery powered, radio controled, and unconventional in their design. Sailing: I own two sport catamarans, a Nacra 5.8 and a Prindle 19. I also sail and race larger boats with friends. Graphic Design: I designed the DjVu logo and much of the AT&T DjVu web site. Reading European comics. Comics in certain European countries (France, Belgium, Italy, Spain) are considered a true art form ("le 8-ieme art"), and not just a business with products targeted at teenagers like on this side of the pond. Although I don't have a shred of evidence to support it, I claim to have the largest private collection of French-language comics in the Eastern US. making bad puns in French, but I don't have much of an audience this side of the pond. Sipping wine, particularly red, particularly French, particularly Bordeaux, particularly Saint-Julien. No deep science here, but if you are looking for a simple/automatic way to make all your publications (digital or paper-based) available on your web page, visit Bib2Web. Photos taken at various conferences, workshops, trade shows and other professional events. Includes pictures from CVPR, NIPS, Learning@Snowbird, ICDAR, CIFED, etc. A photo and movie gallery of various radio-controled airplanes, other miniature flying objects, lego robots, and other techno toys. Check out also my model airplane page. Miscellaneous artsy and nature picture, including garden-variety wild animals, landscapes, etc. Vintage airplanes at the national air and space museum in Le Bourget, near Paris. Your Name can't possibly be pronounced that way: or how a Nobel prize winner tried to tell me how to pronounce my own name. Who is Tex Avery anyway? My former group at AT&T (the Image Processing Research Department) and its ancestor (Larry Jackel's Adaptive Systems Research Department) made numerous contributions to Machine Learning, Image Compression, Pattern Recognition, Synthetic Persons (talking heads), and Neural-Net Hardware. Specific contributions not mentioned elsewhere on this site include the ever so popular Support Vector Machine, the PlayMail and Virt2Elle synthetic talking heads, the Net32K and ANNA neural net chips, and many others. Visit my former group's home page for more details. Links to interesting places on the web, friends' home pages, etc .